In a time of divisiveness and toxic public discourse, he called on those in the room to “get on a path where we tap into the best within us”—to get off the sidelines, to find out what we share in common and actively build on it, amid our differences and legitimate grievances. 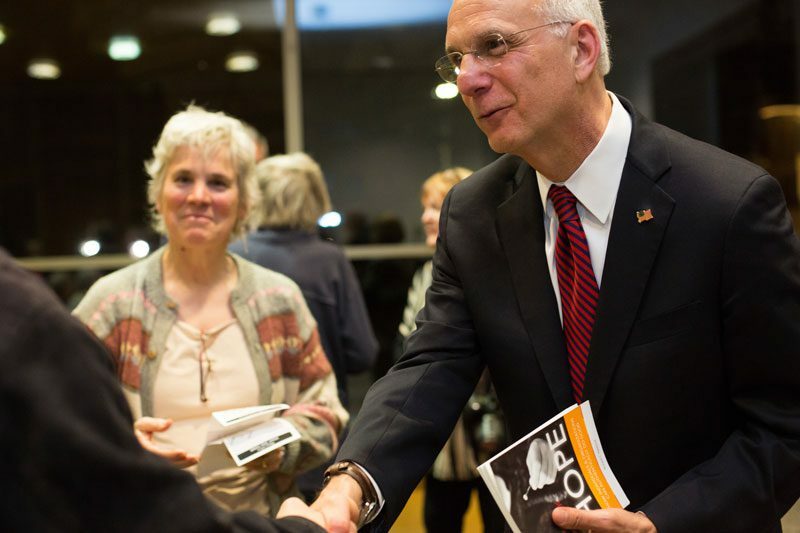 For 30 years, The Harwood Institute has been working to help people, organizations, and communities bridge divides, create a culture of shared responsibility, and find a renewed sense of hope and a real path forward. Our library embraces the Harwood Institute’s “turning outward” approach, which can be thought of as a posture or a stance. It means we make the choice to ground our work in the aspirations of the community. And we treat people as citizens, not consumers. 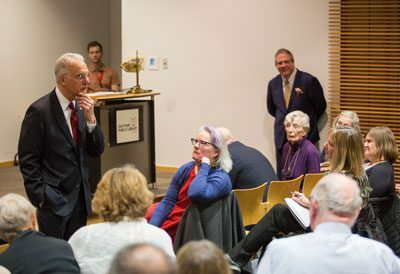 “You ask the community what is important to it, you listen, and you act upon what you learn by designing your services and programs accordingly,” the library’s Executive Director David J. Seleb said. The turning outward orientation and mindset “has changed so much about how I think and the life of this organization,” he said, pointing to the library’s decision to hire a social worker as one direct result. Anyone can adopt a turning outward stance, from organizations to individuals. Do you look inward, or do you reach out? Harwood outlined three practical ways to get on the path forward, and he fielded questions from the audience. When we talk about our problems, we wonder why they aren’t solved. We ask who’s responsible for solving them, we point fingers, and the discussion turns toxic. If we want to get on a more hopeful path, Harwood told the audience, we need to change the conversation in our communities. “If you ask people about their aspirations for their lives and for their community, what they say will come from their gut,” he said. And in most cases, people’s aspirations are doable. “When we talk about our aspirations, we realize we share things in common. We develop a shared language and a sense of possibility,” he said. That’s important because no one single institution or citizen can achieve a community’s aspirations on their own. We need to develop our civic confidence that we can get things done together, Harwood told the crowd. 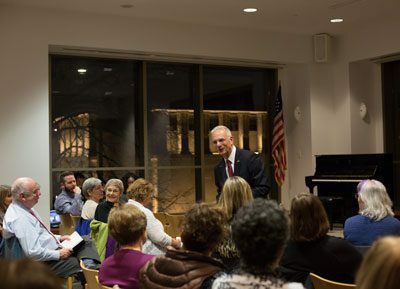 But, as one audience member noted, how do you do that when the people who show up—like those in the library’s Veterans Room that night—aren’t fully representative of Oak Park? The greatest hidden factor in whether we move forward or slide backward? The stories we tell about ourselves, each other, and our lives. “And many narratives in our communities right now are negative,” Harwood said. 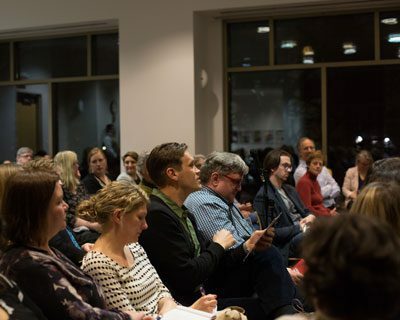 But, as one audience member asked, for a community like Oak Park, with a celebrated history of racial integration and progressive values, how do you not let that positive but perhaps dated narrative get in the way of further progress? While celebrating the progress Oak Park has made, it can’t rest on its laurels, Harwood replied. In a community like Oak Park, organizations that span borders are increasingly important. Also important: making room for the next generation of leaders.